How to correctly wire up a ceiling rose, test all the wires that connect to the rose and also wire in a switch. In this DIY project guide we will show you how to wire a ceiling rose. On first glance a ceiling rose can look very confusing as in most cases there are quite a few wires running to and from other light fixtures and light switches. In this project you will find an easy to use ceiling rose wiring diagram and a description of what colour wire, be it an earth wire or red or brown live wire, should be connected to what terminal. Take a good look at the ceiling rose diagram and identify the switch wires. These are the wires which give most people problems. The power comes into the ceiling rose from either the consumer unit or the last lamp. It is then sent to the next lamp via the connecting blocks in the ceiling rose. This is straight forward as you can see. The live wire coming in is connected to the live wire going out. Ditto for the Neutral and Earth wires. 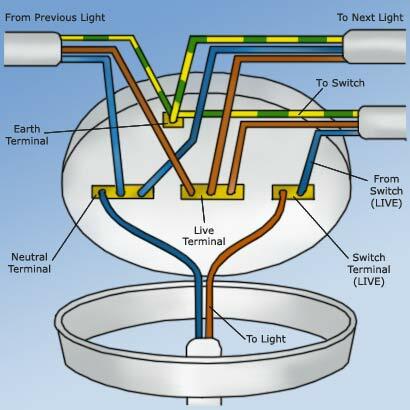 When a light fitting is attached to the ceiling rose it could be wired into the Neutral terminal and the live terminal shown in the rose but it would of course be on all of the time. For it to work properly it has to be interrupted by a switch. This is easy, in that a cable (switch wire) is added. One of the wires from the switch wire is connected to the live terminal. This takes live current to the light switch. The other wire (The earth goes straight to earth and should not be used as a live wire under any circumstances) is then connected to the switch terminal in the ceiling rose. This wire brings live current back to the rose to complete the loop. So; we have live current going down to the switch which, when switched on, will allow the current through the switch, back up to the rose allowing live current to reach the light fitting. The major mistake when replacing a light fitting (see wiring a light fitting project for more information) is to connect all the black (or blue) wires together and all the reds (or browns) together. As you can see from the diagram both switch wires are live wires so this mistake means you are, when the switch is on, connecting a live wire to a neutral set of wires which will trip the fuse. The black (or blue) wire in the switch cable should have a little red tape or sleeve on it to mark it out as being live. This rarely happens so please take care. To watch a film on fitting a ceiling fan, go to our video section on installing ceiling fans for a visual demonstration. What Are The New Wiring And Cable Colours?